PRESS RELEASE: EU Project GoJelly - Jellyfish: Disgusting? Useful! NIB participates in European research project on the use of jellyfish blooms as solutions for producing new products. Global climate change and the human impact on marine ecosystems result in decreasing the number of fish in the ocean. 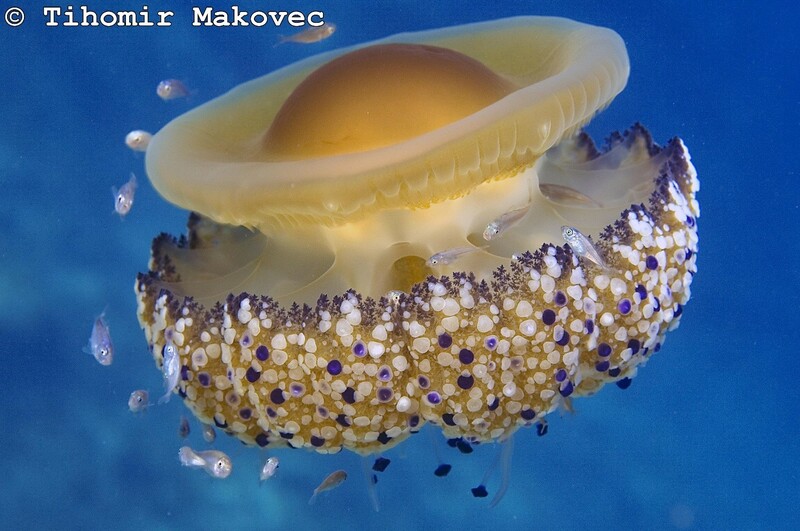 Since overfishing decreases the numbers of jellyfish competitors, their blooms are in rise. They are regarded as annoying and even dangerous. The GoJelly project, coordinated by the GEOMAR Helmholtz Centre for Ocean Research, Germany, would like to change this perception and use jellyfish as source to produce microplastic filter, fertilizer or fish feed. The European Union now approved its funding of EUR 6 million. While some people might find these slimy creatures at the beach very exciting, a number of species are poisonous; some tropical species are even among the most toxic animals on earth. Even worse, rising water temperatures, ocean acidification and overfishing seem to favor the jellyfish blooms. More and more often, they appear in huge swarms, which have already destroyed whole fish farms on European coasts and blocked cooling systems of power stations near the coast. Can we find a solution to this emerging environmental threat? A consortium of 15 scientific institutions from eight countries coordinated by the GEOMAR Helmholtz Centre for Ocean Research Kiel has an innovative idea. In the GoJelly project, funded by the European Union with six million euros over a four-year period, they want to sensibly use this perceived threat. “In Europe alone, the imported American comb jelly has a biomass of one billion tons. While we tend to ignore the jellyfish, there must be other solutions,” says Dr. Jamileh Javidpour of GEOMAR, initiator and coordinator of GoJelly. First, there is still basic work to do for all partners. The life cycle of many jellyfish species is only scarcely explored. Therefore, it is almost impossible to predict when and why a large jellyfish bloom will occur. “This is what we want to change so that large jellyfish swarms can be caught before they reach the coasts,” says Dr. Javidpour. At the same time, the project partners will already be working on the second step and try to answer the question: What to do with the caught biomass? One idea is, for example, to use it against another, man-made threat. “Studies have shown that mucus of jellyfish can bind microplastic. Therefore, we want to test whether biofilters can be produced from jellyfish. These biofilters could then be used in sewage treatment plants or in factories where microplastic is produced,” explain the researchers. Jellyfish can also be used as fertilizers for agriculture or aquaculture feeds. “Fish in fish farms are currently fed with captured wild fish which does not reduce the problem of overfishing, but increases it. Jellyfish as feed would be much more sustainable and would protect the natural fish stocks,” says the GoJelly team. The researchers also think of food production for human consumption. “In some cultures, jellyfish are already on the menu. As long as the end product is no longer slimy, it could also gain greater general acceptance,” stresses Dr. Javidpour. Finally, yet importantly, jellyfish contain collagen, a substance very much sought after in the cosmetics industry. In the project, Dr. Ana Rotter and her team from the Marine Biology Station (National Institute of Biology) will investigate the possibilities of producing a microplastic biofilter, based on jellyfish mucus and the use of jellyfish biomass as fertilizers. NIB will also be in charge of the overall dissemination of project activities. “Jellyfish can be used for many purposes. We see this as an opportunity to use the potential of the huge biomass drifting right before our front door,” summarizes Dr. Javidpour the approach of the project. Please notice: The European Union is funding the GoJelly project as part of the Horizon2020 framework program.